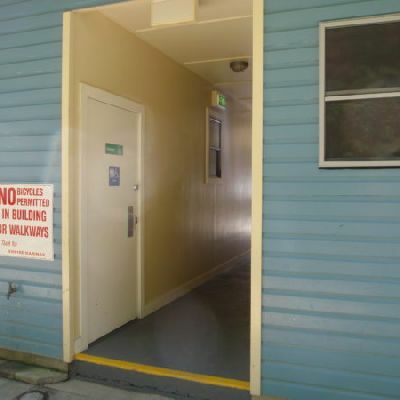 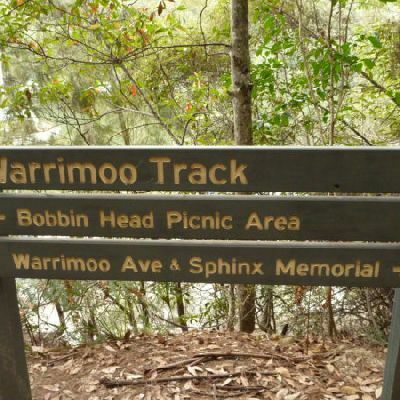 This image is near the Int of Warrimoo and Bobbin Head Tracks. 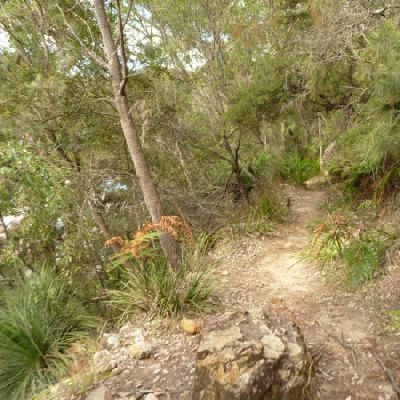 This walk from the Turramurra entry to Ku-ring-gai Chase National Park, this is an alternative way to get down to Bobbin Head. 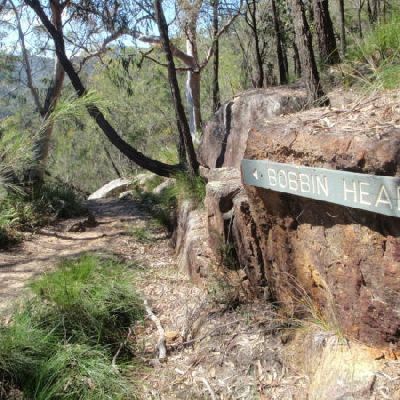 This walk mostly follows the old road down to Bobbin Head, starting along the flat management trail with its red dirt and high heath. 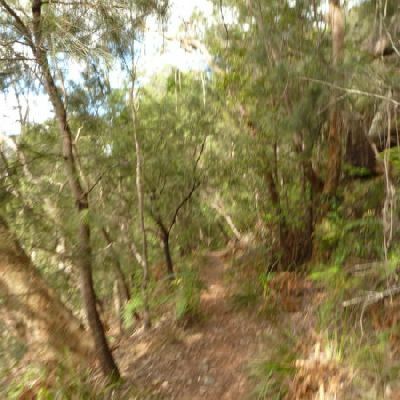 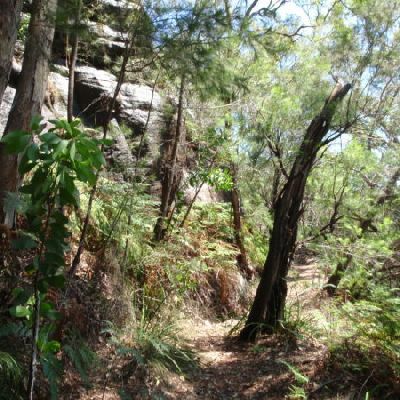 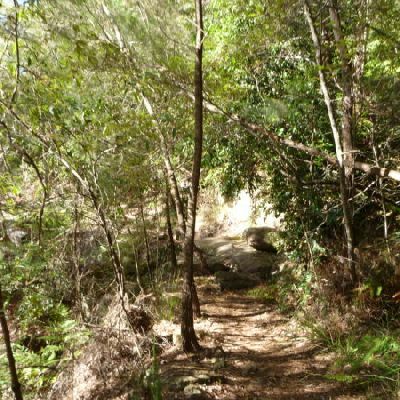 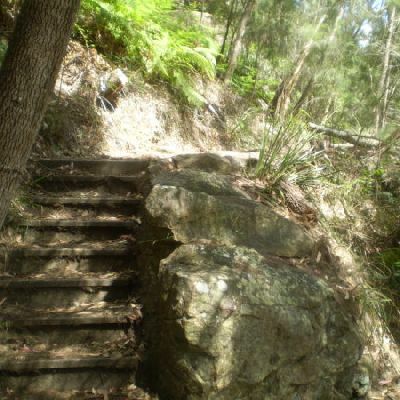 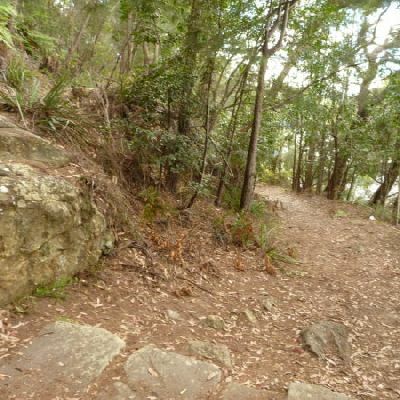 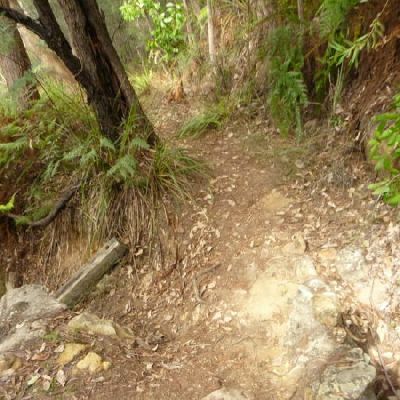 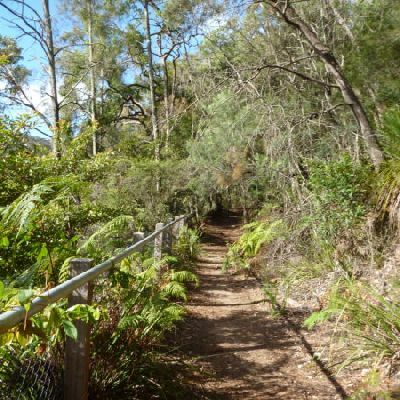 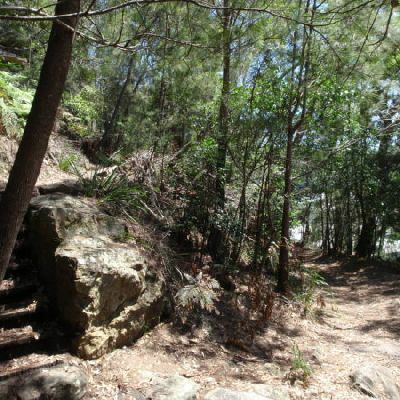 About halfway along, the track becomes steeper as it winds down the hill, and then joins up with a bush track leading through the rocks to Warrimoo track, which you then follow to Bobbin Head. 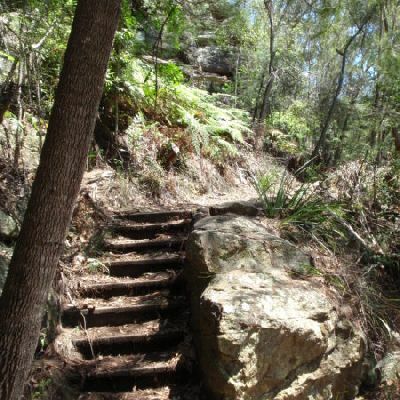 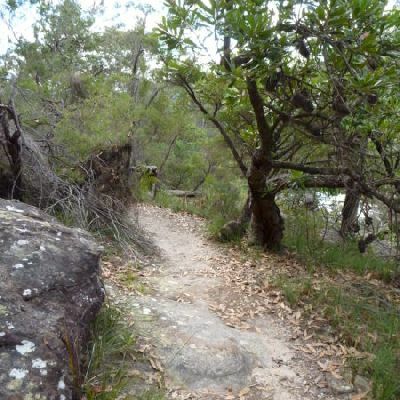 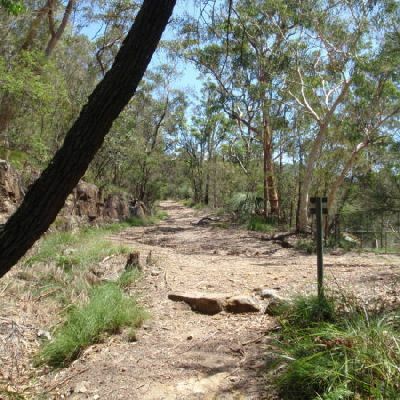 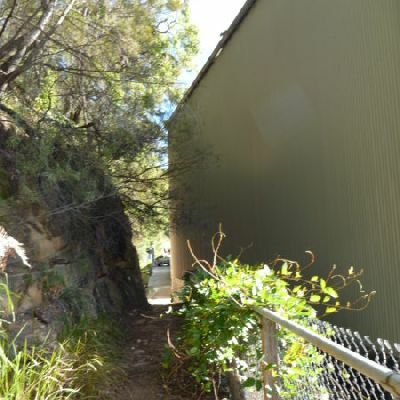 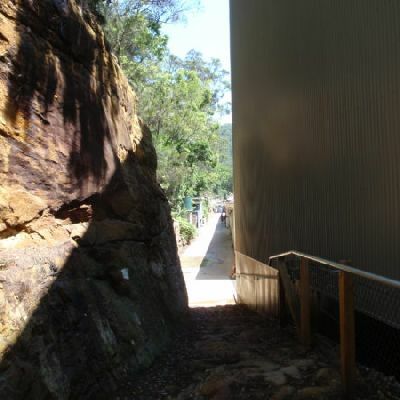 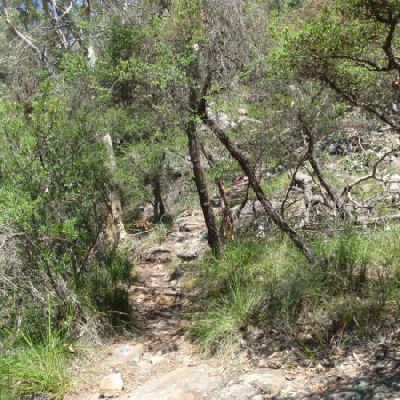 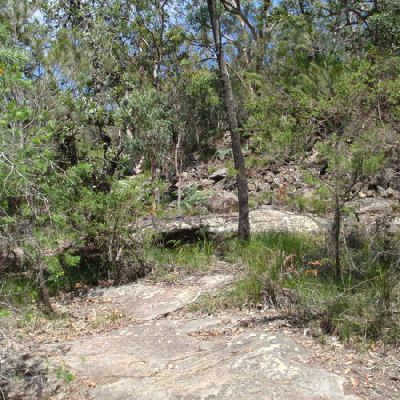 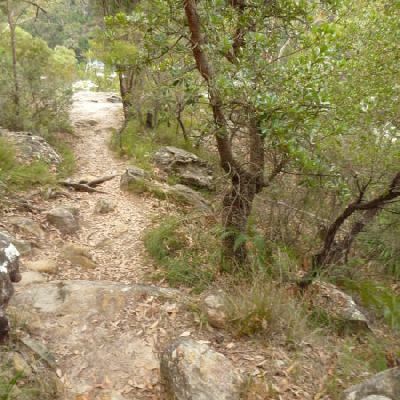 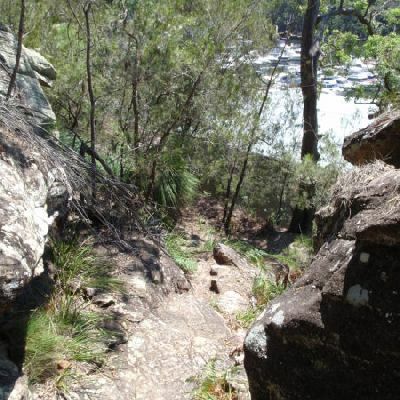 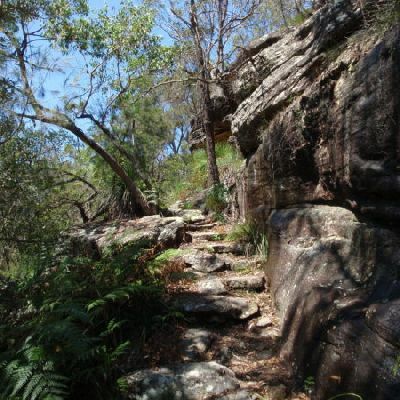 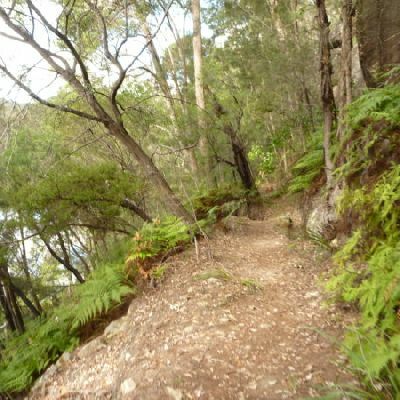 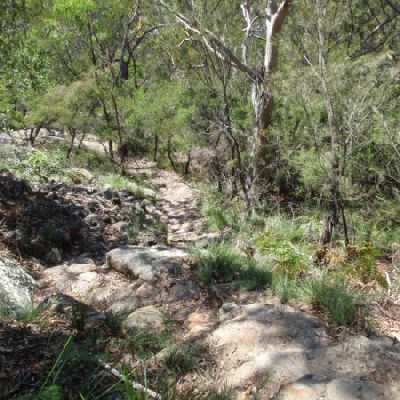 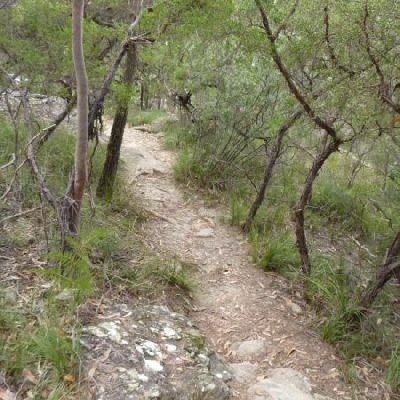 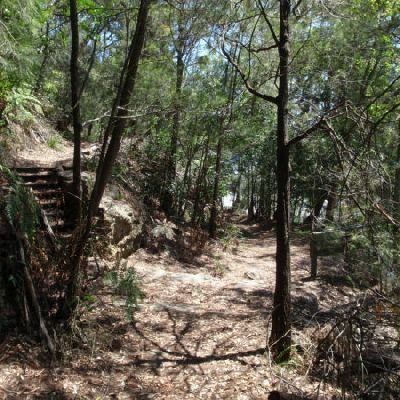 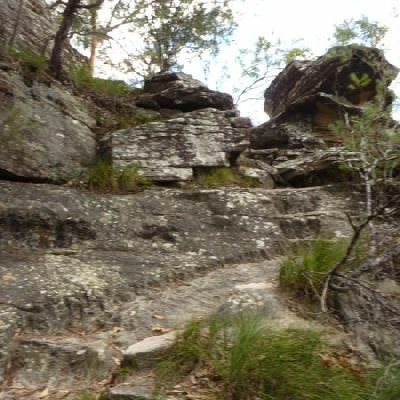 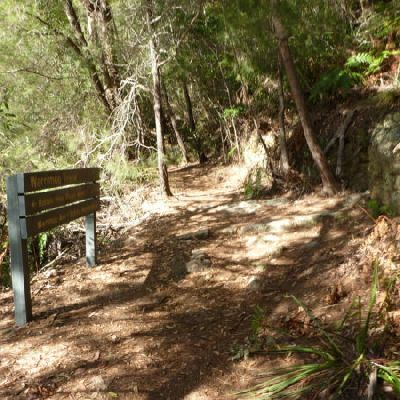 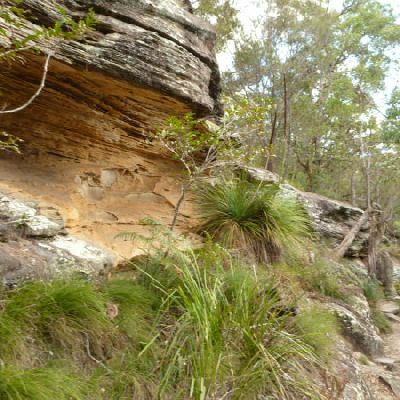 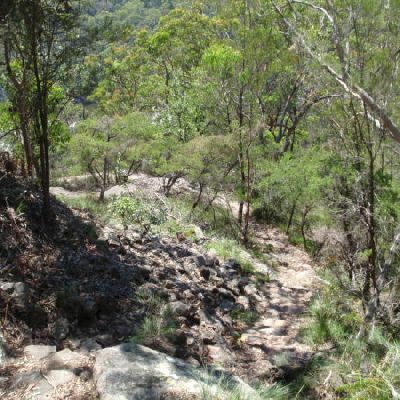 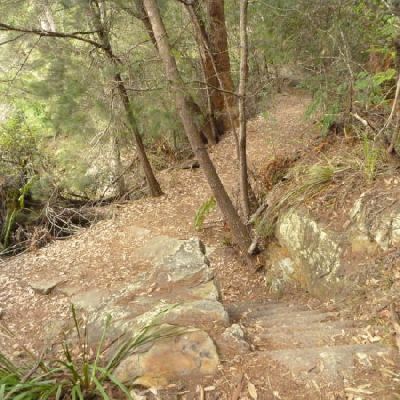 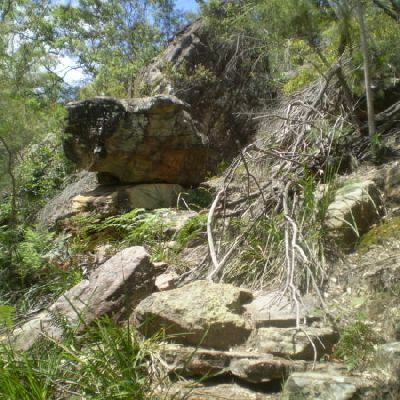 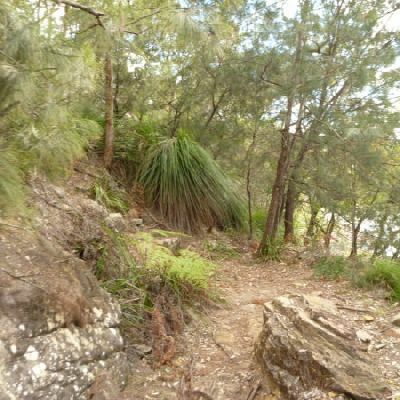 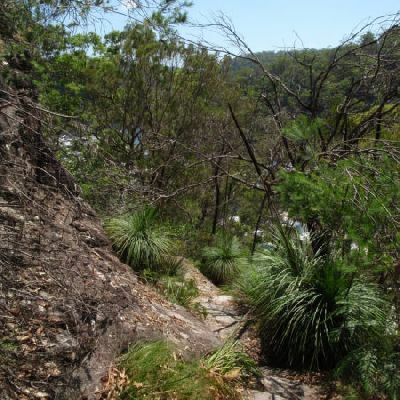 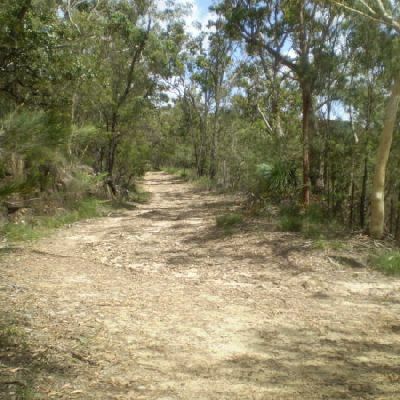 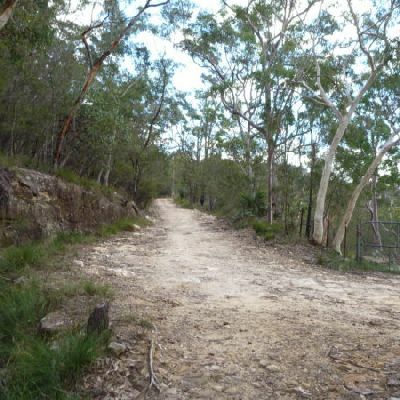 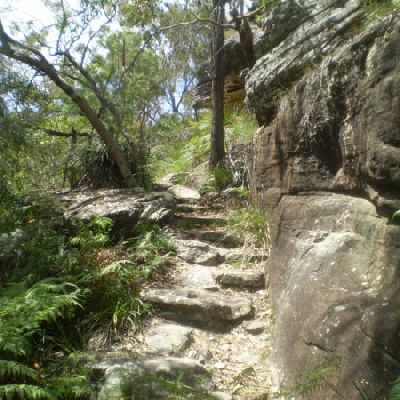 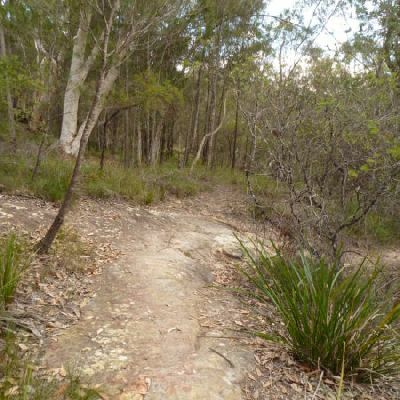 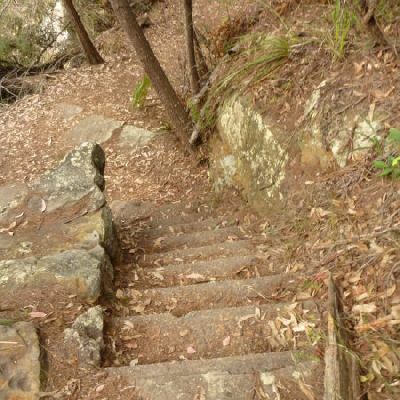 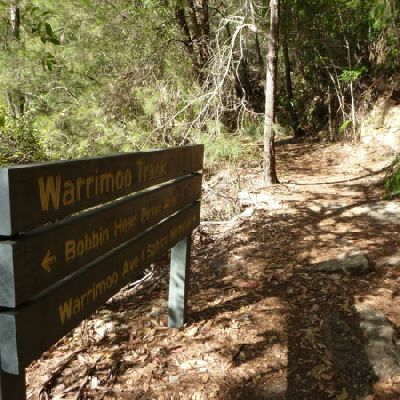 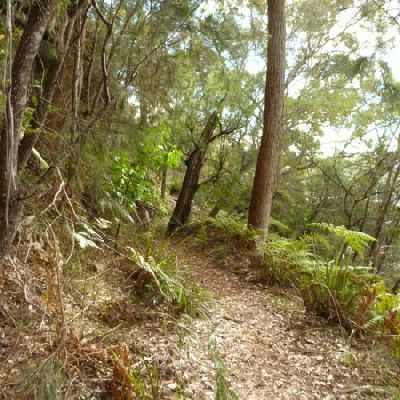 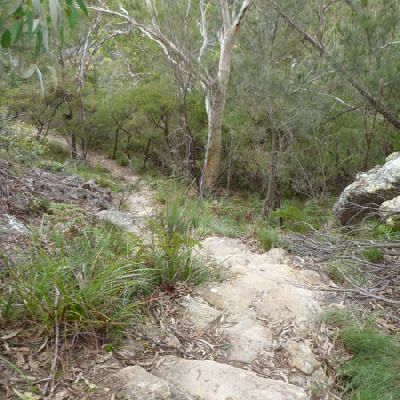 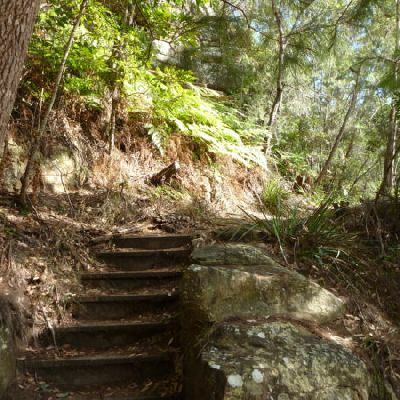 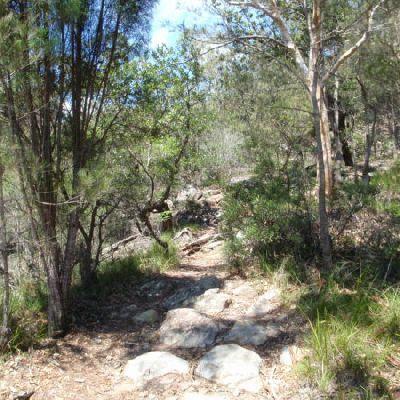 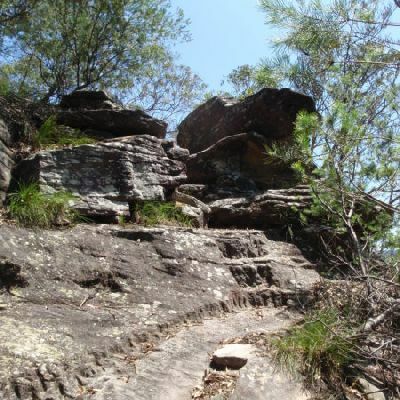 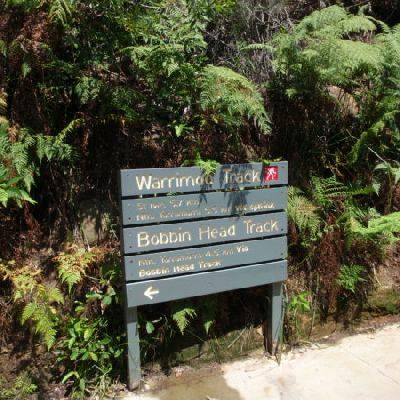 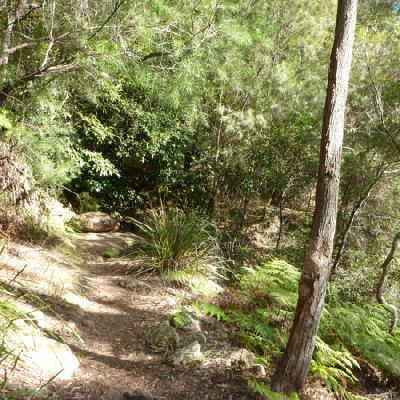 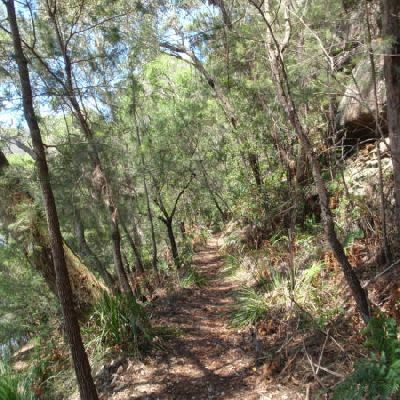 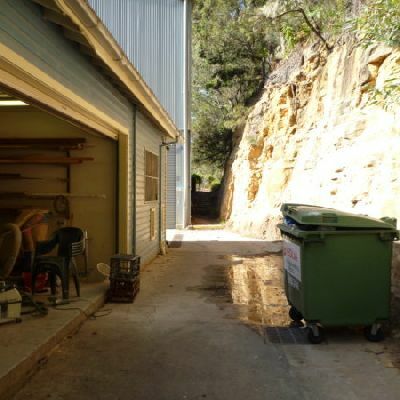 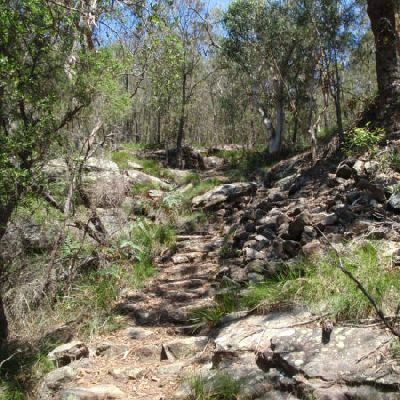 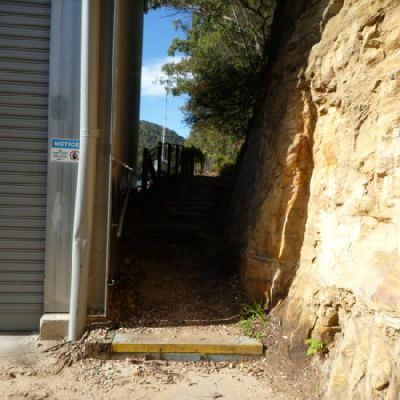 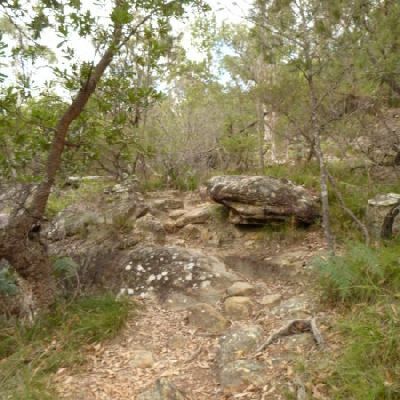 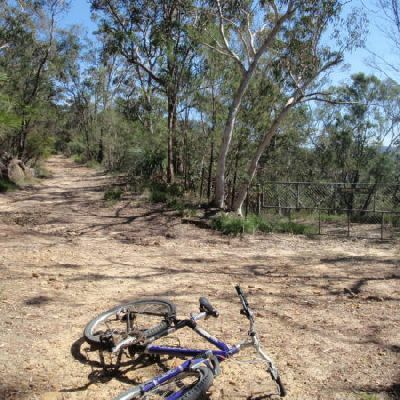 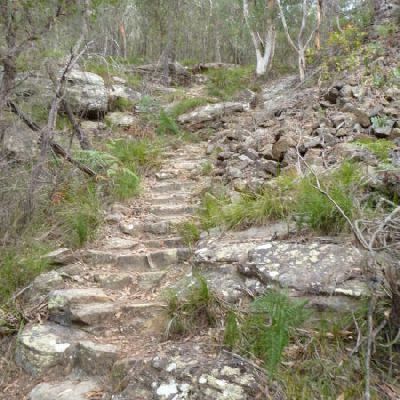 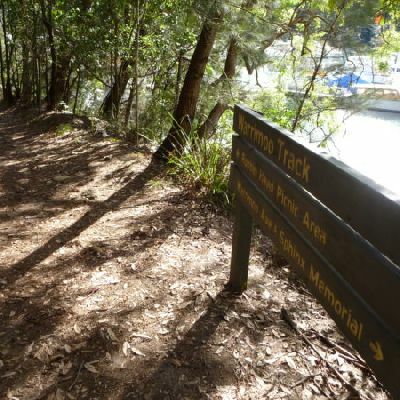 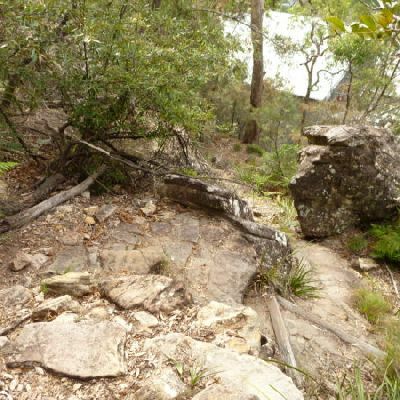 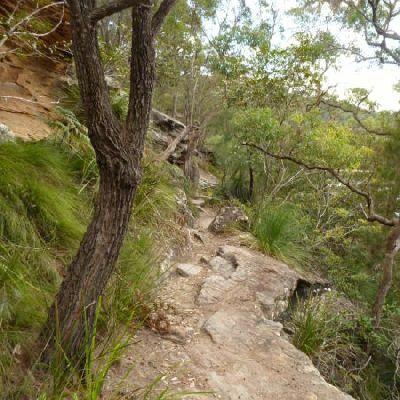 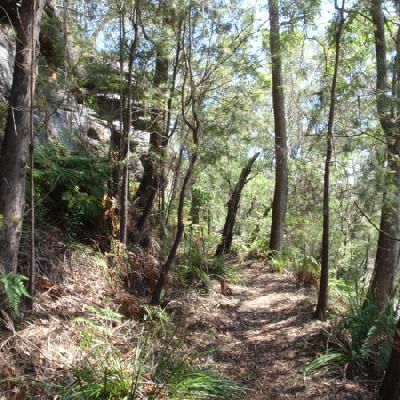 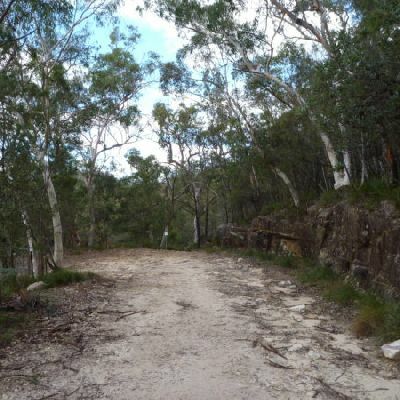 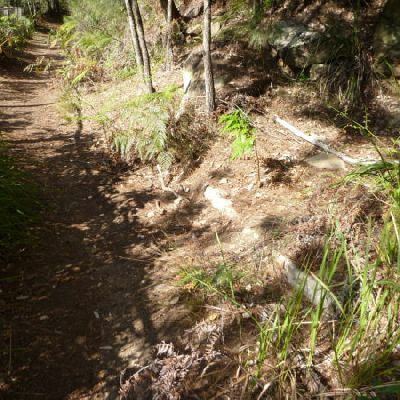 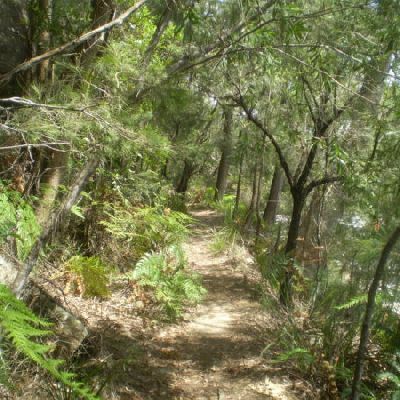 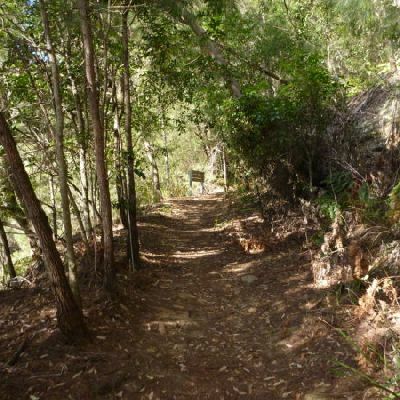 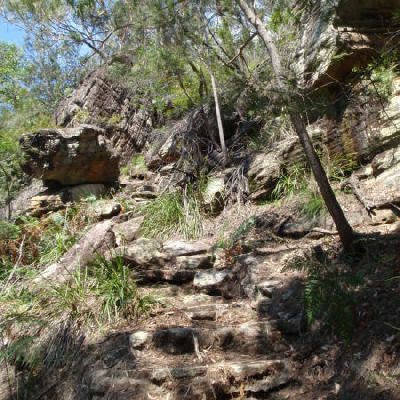 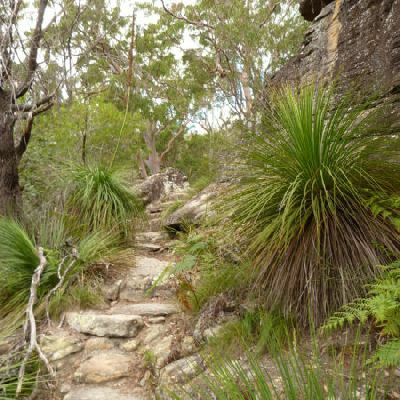 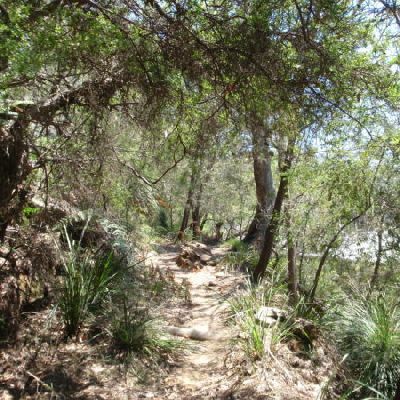 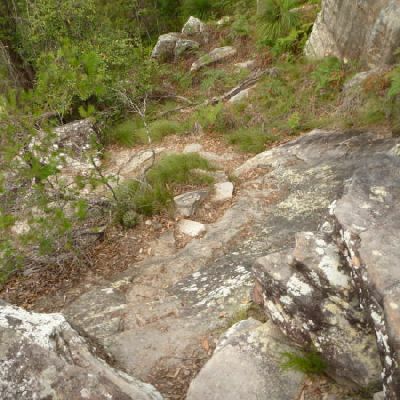 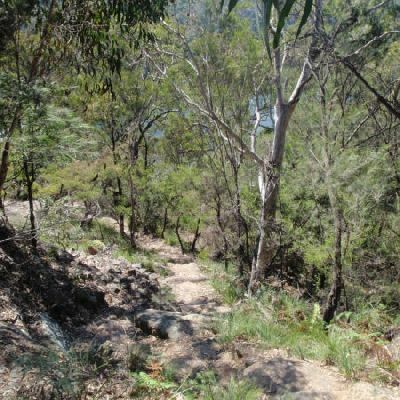 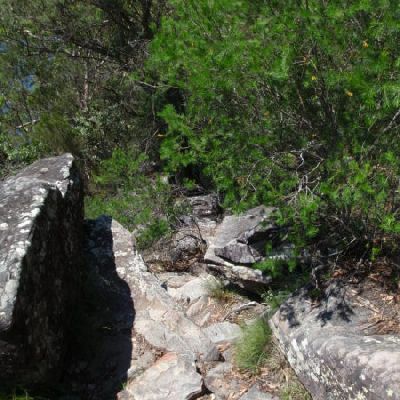 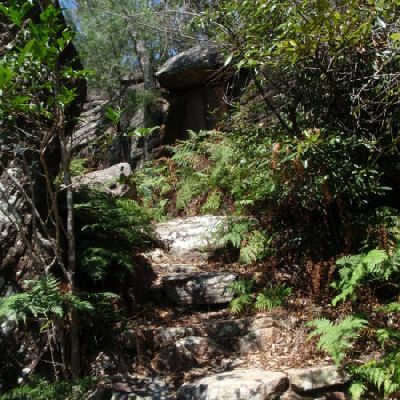 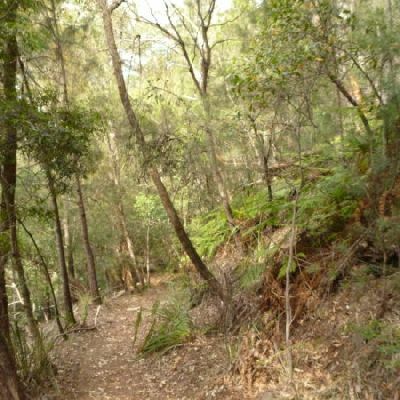 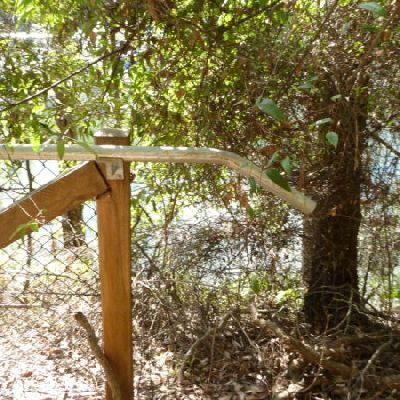 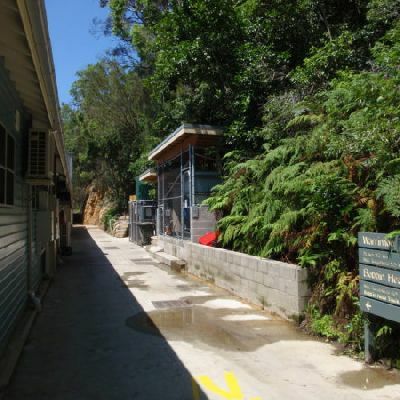 The Warrimoo Track is a great walk for exploring the upper reaches of Cowan Creek. 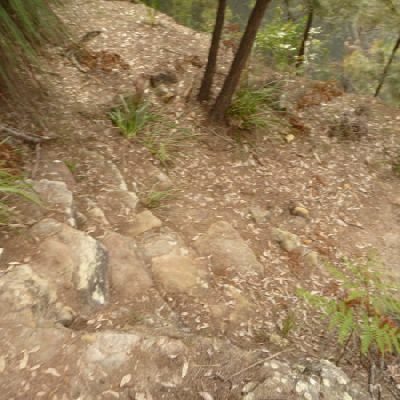 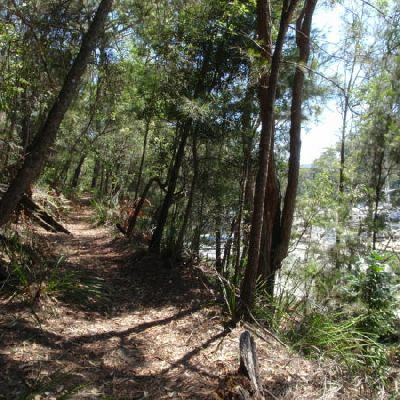 This walk wanders down the ridge to follow the bank of Cowan Creek to Bobbin Head. 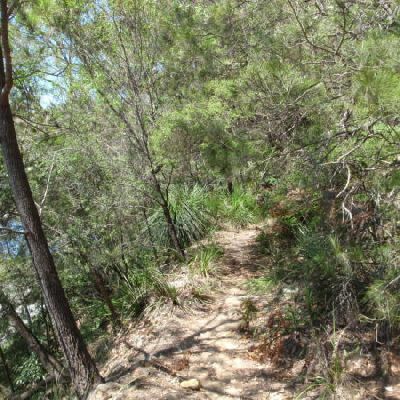 There are many different views to be seen and a variety of flora and fauna throughout makes this walk quite interesting. 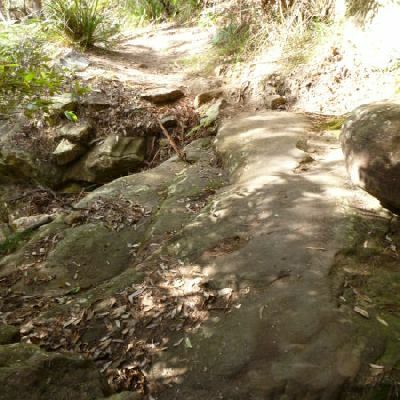 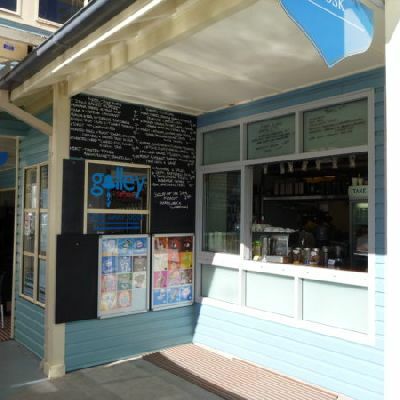 Enjoy a cool drink from the cafe at the end of the walk. 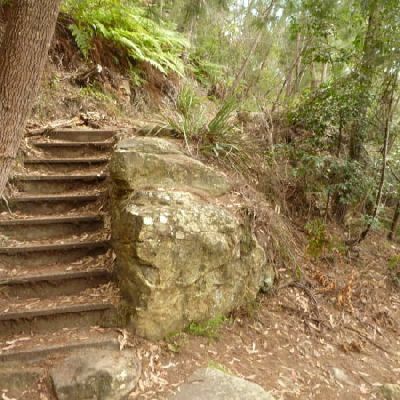 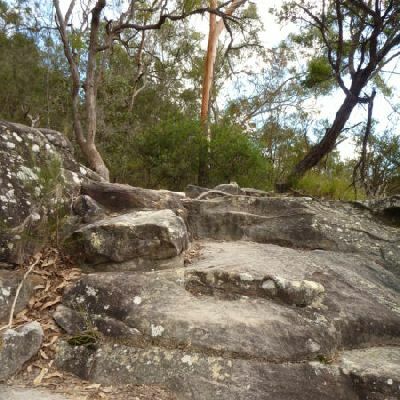 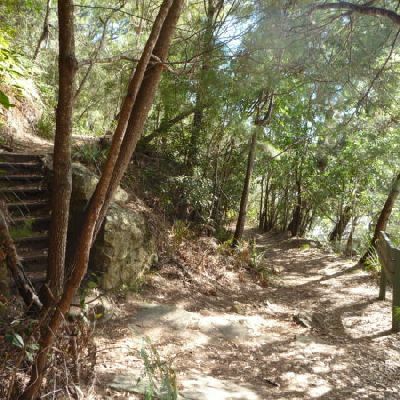 This pleasant walk starts in North Turramurra and follows the Darri and Warrimoo tracks into the Ku-ring-gai Chase National Park. 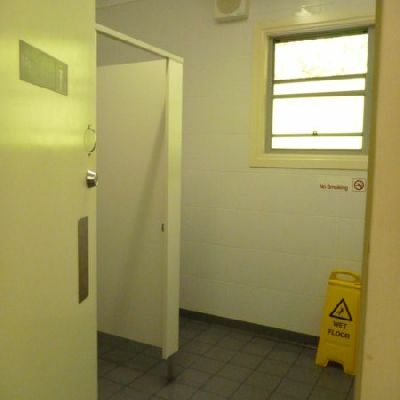 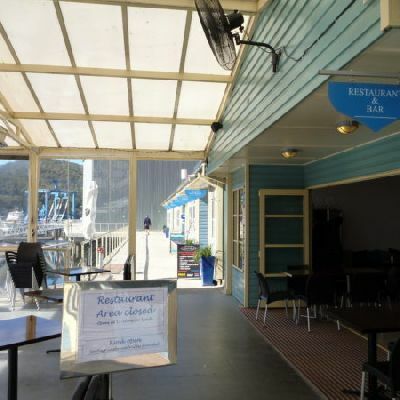 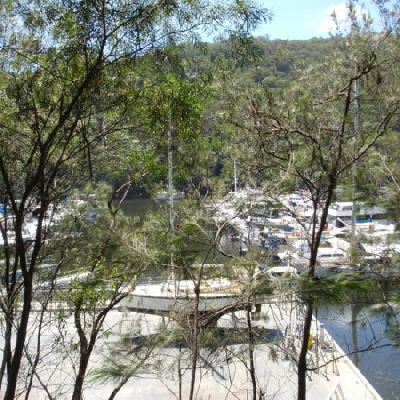 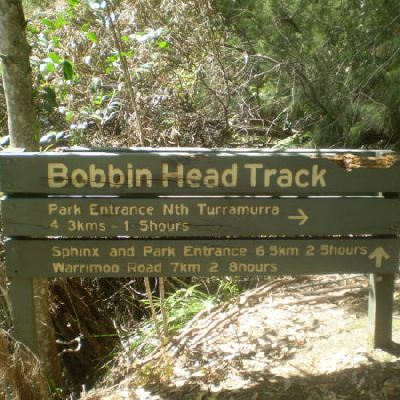 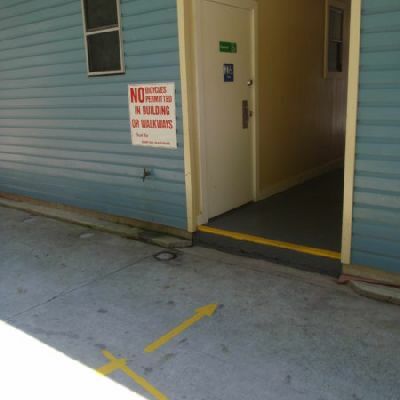 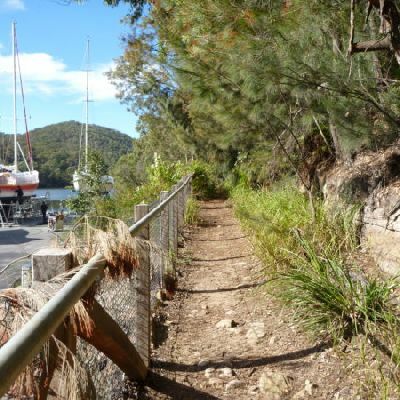 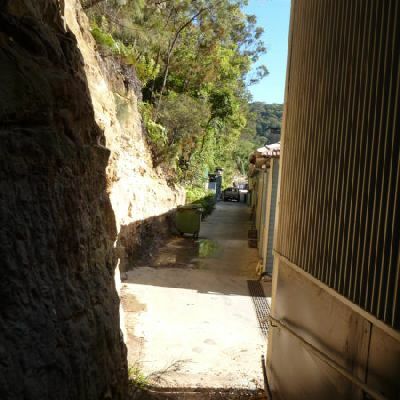 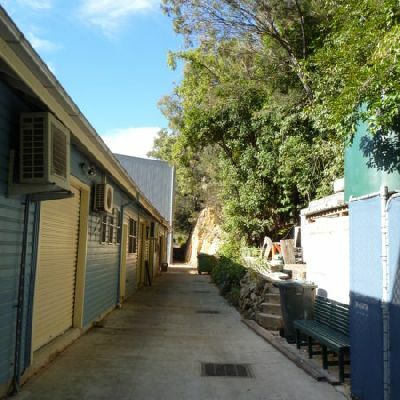 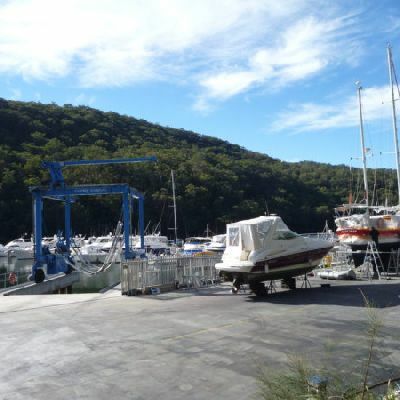 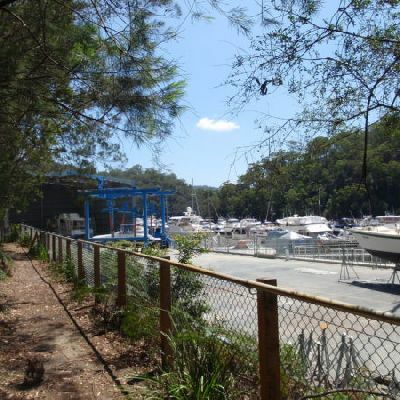 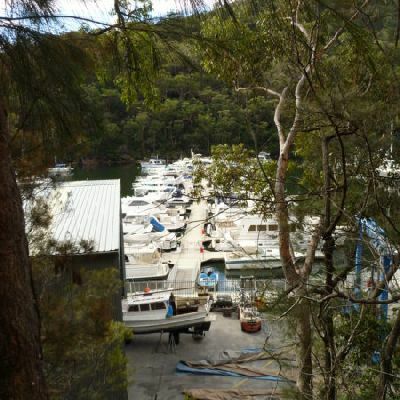 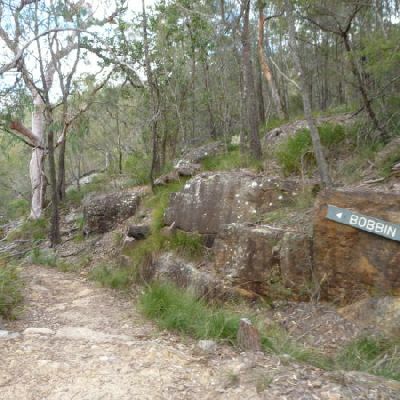 The walk follows the picturesque Cowan Creek through one of the most serene parts of the park, and finishes at Bobbin Head, a great place to enjoy the cafe or have a picnic lunch. 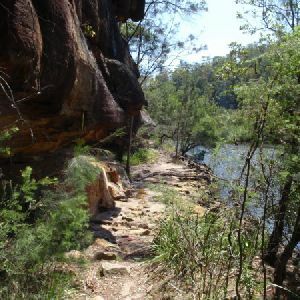 This great walk starts at the Sphinx Memorial and loops around via Cowan Creek, exploring diverse environments as it changes altitude. 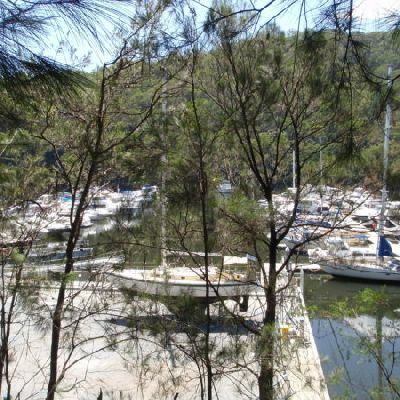 There is an optional side trip to the Empire Marina and cafe for a recharge before the climb back up to the Sphinx. 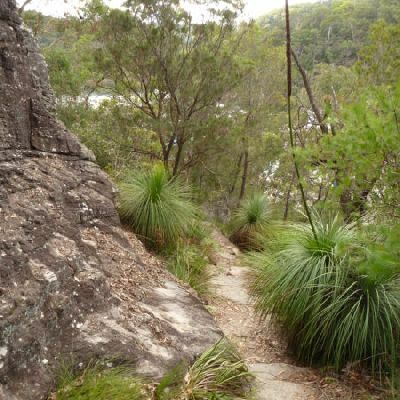 This walk provides some great water views of the Cowan Creek and the interesting rock formations along its shores. 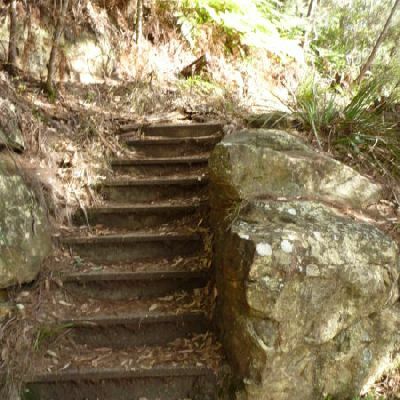 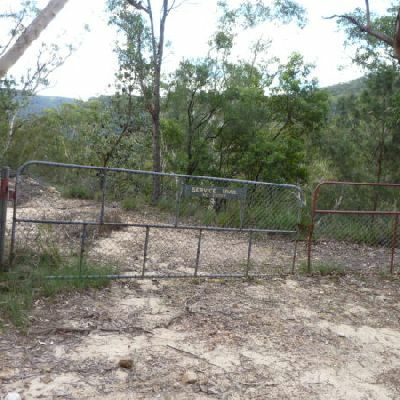 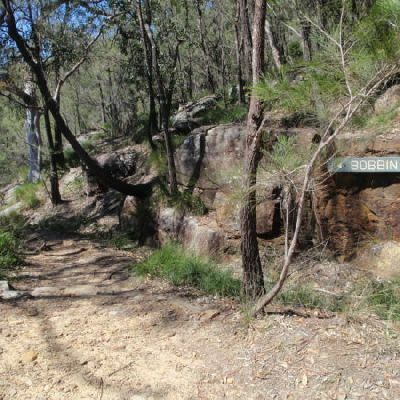 This walk starts at the Sphinx War Memorial and follows some well maintained and popular walking tracks down to Cowan Creek. 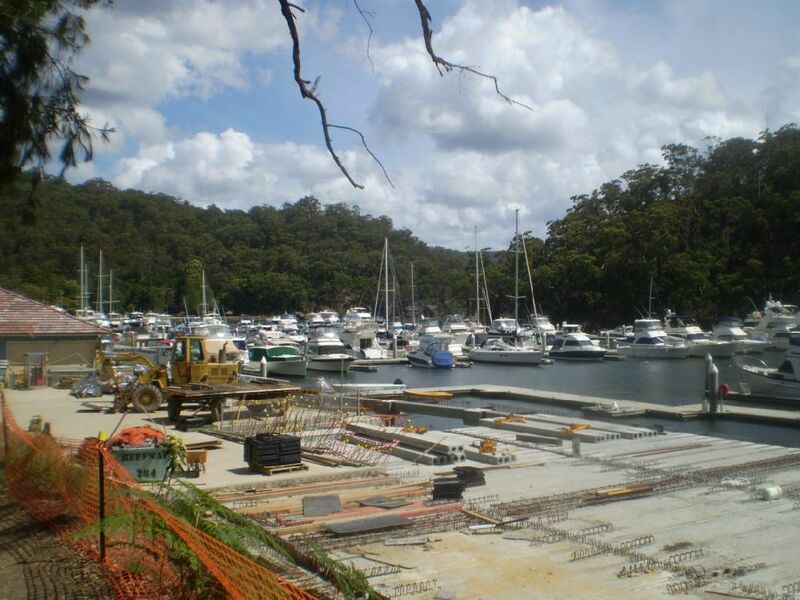 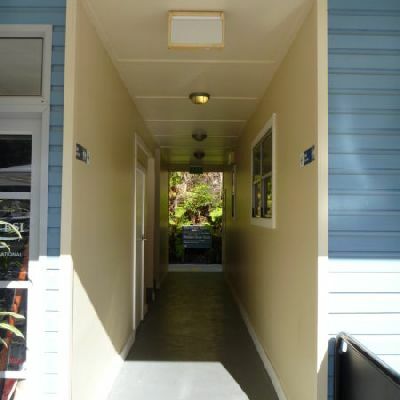 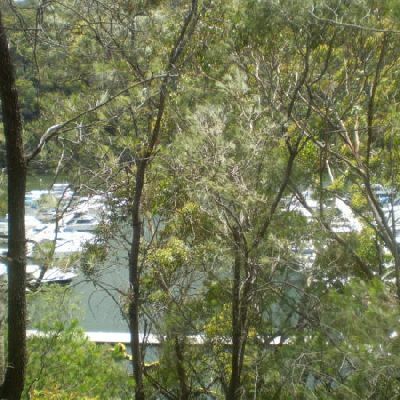 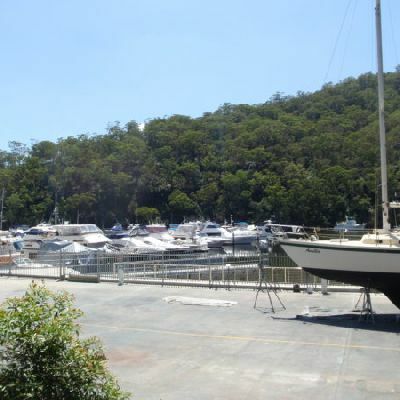 Enjoy the water views as you head through Bobbin Head and Apple Tree Bay. 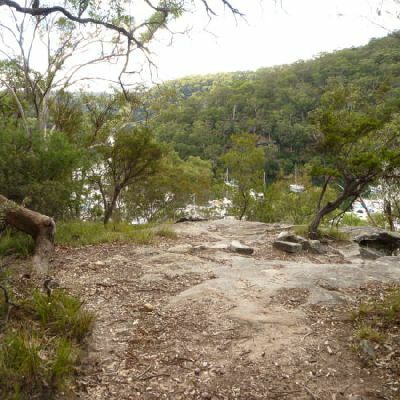 The walk continues through the National Park and up the hill to Mt Kuring-gai. 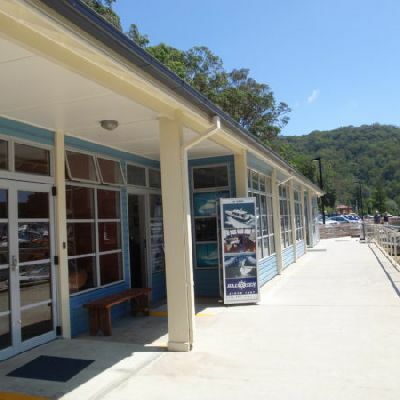 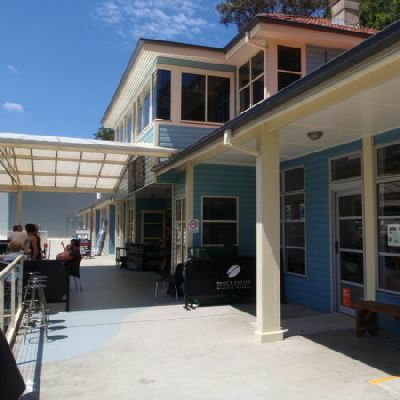 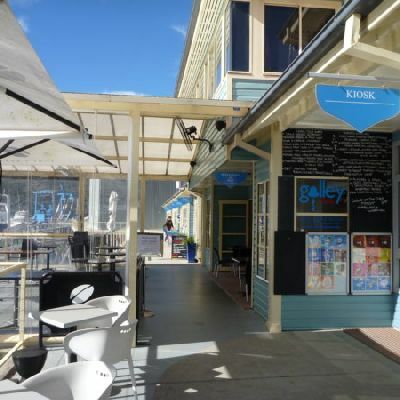 There are plenty of great spots to stop and rest, including a cafe, kiosk and picnic area at Bobbin Head. 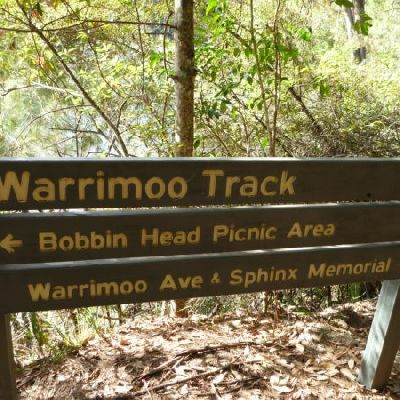 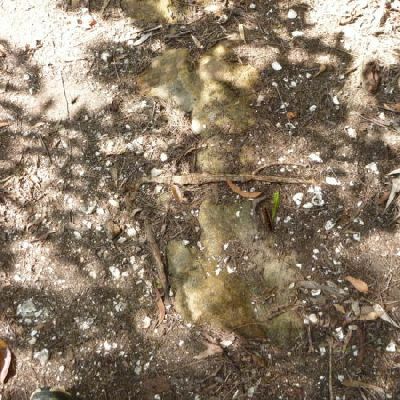 Starting at the Sphinx War Memorial in North Turramurra, this walk follows a series of well-used tracks exploring the waterways and Bobbin Head. 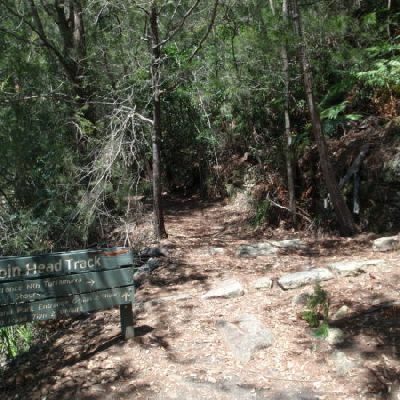 The walk drops through Bobbin Head picnic area before passing through Apple Tree Bay on its way to Mt Kuring-gai. 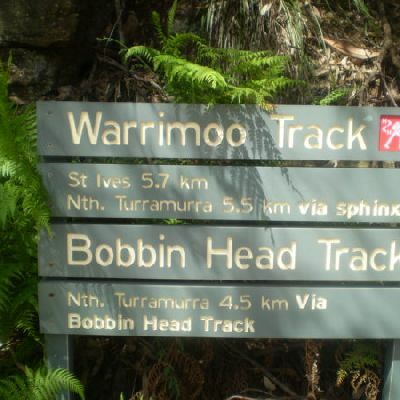 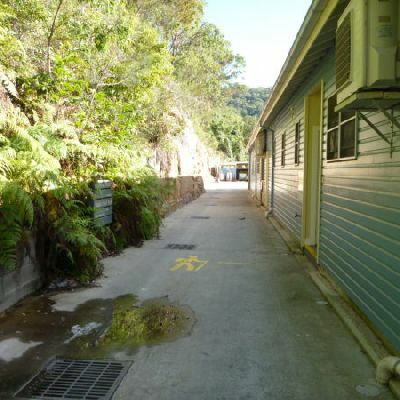 The scenic views and variety of things to do along this track make it a fantastic walk. 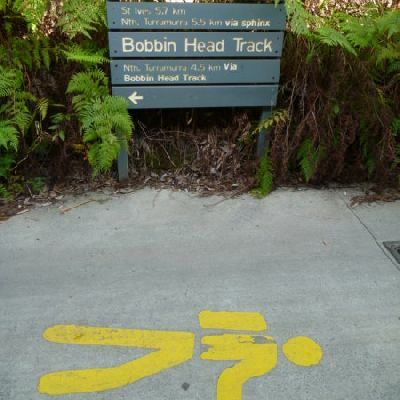 There are a couple of Cafe’s at Bobbin Head to add to this journey. 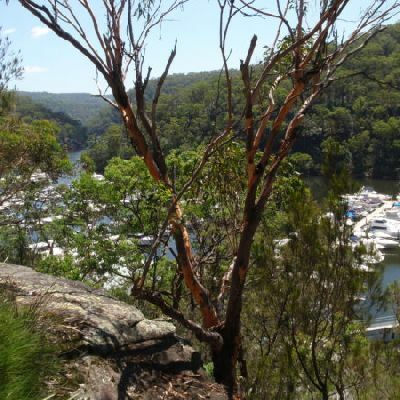 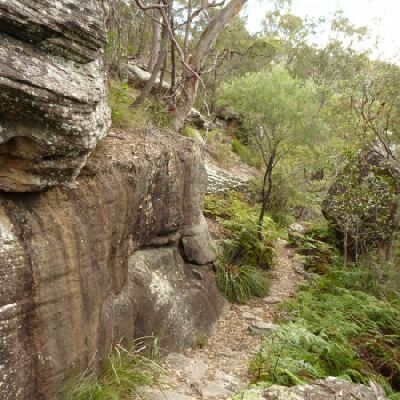 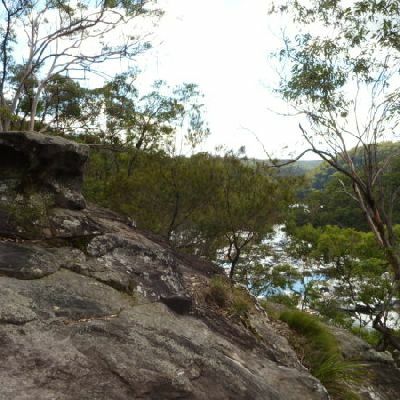 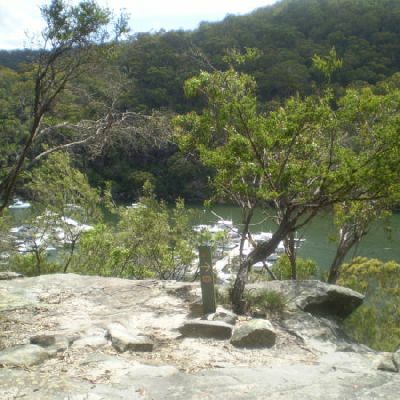 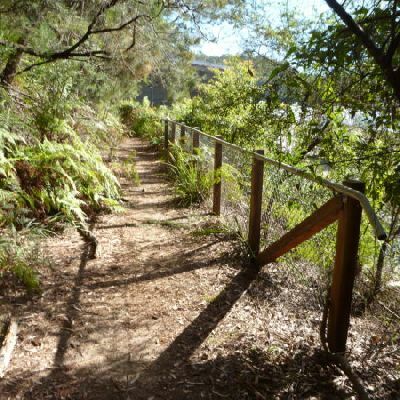 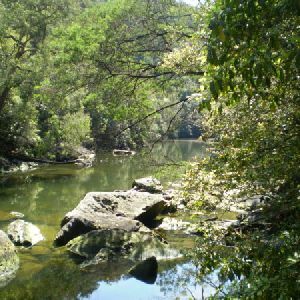 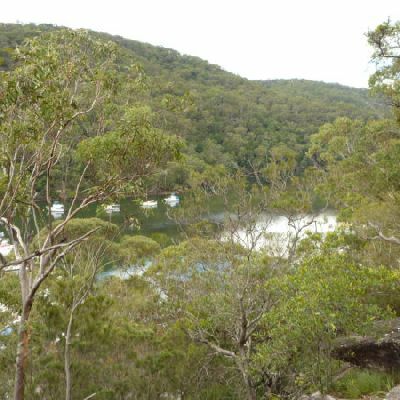 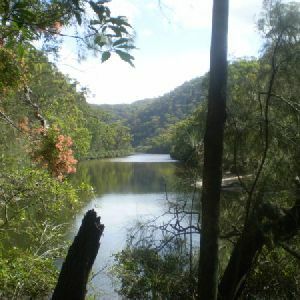 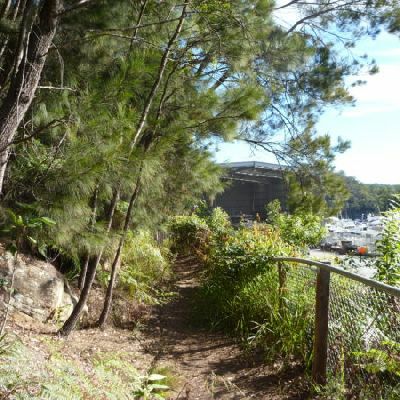 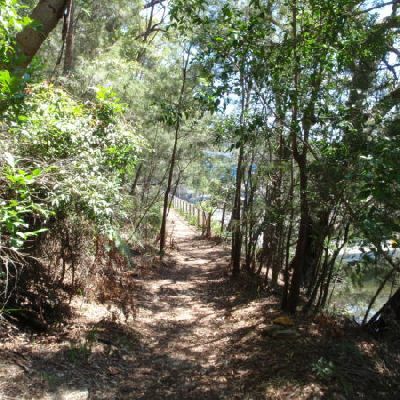 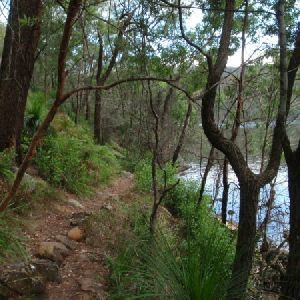 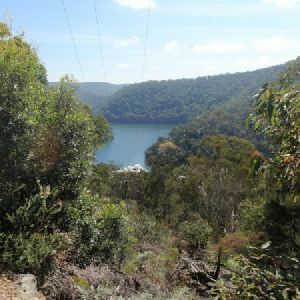 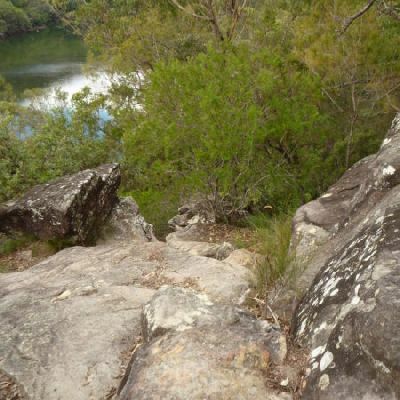 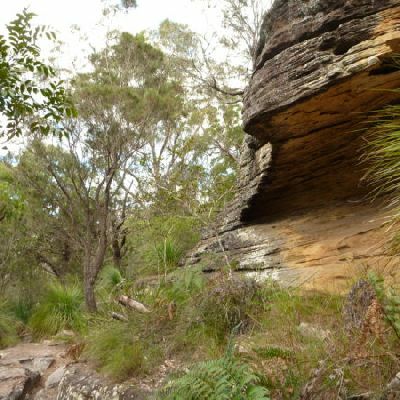 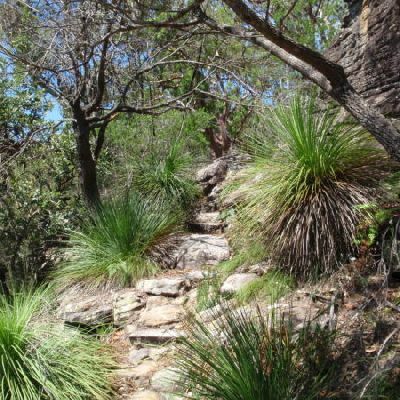 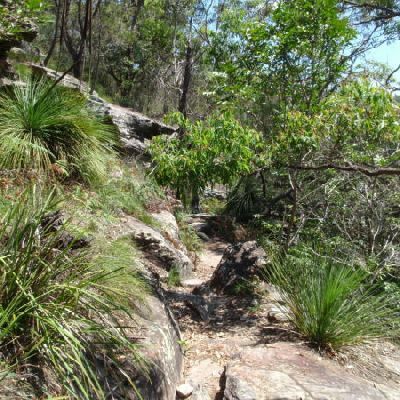 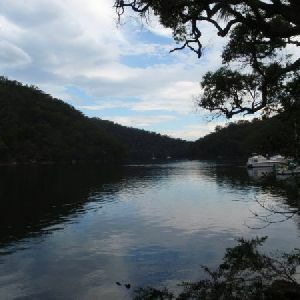 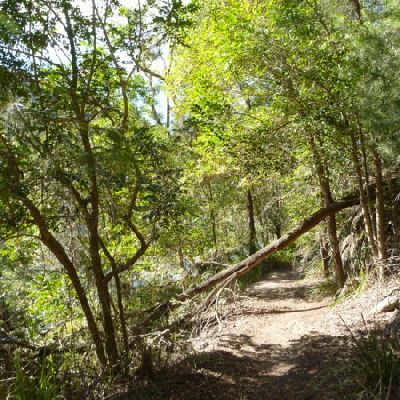 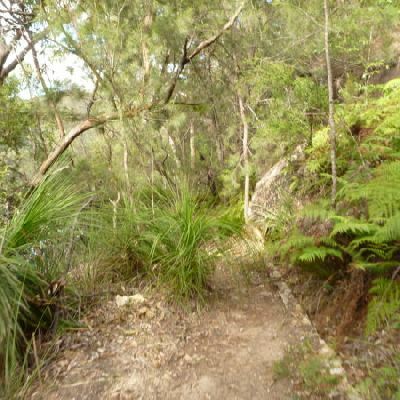 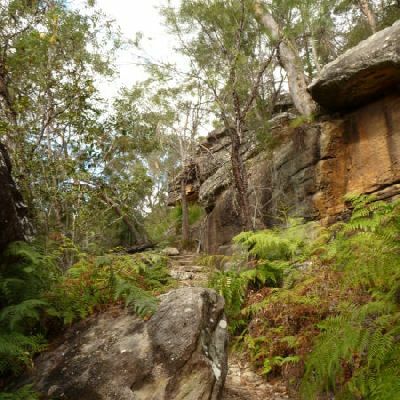 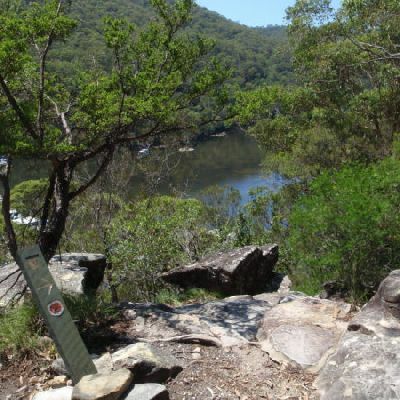 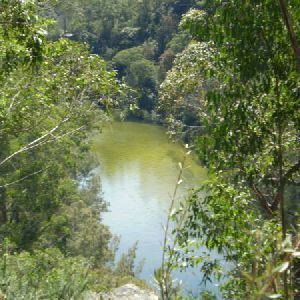 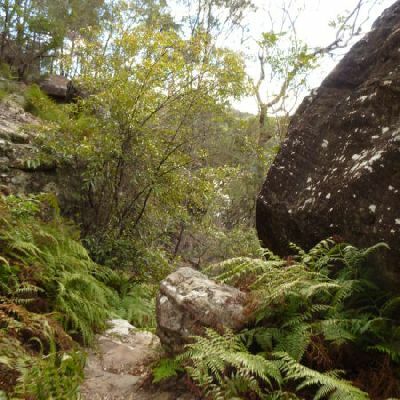 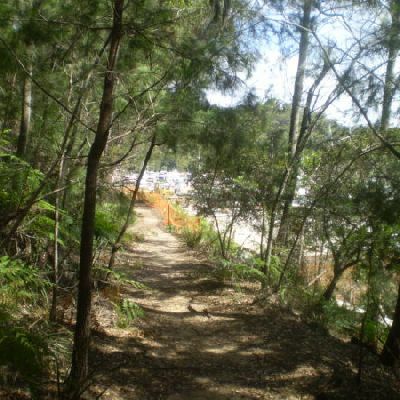 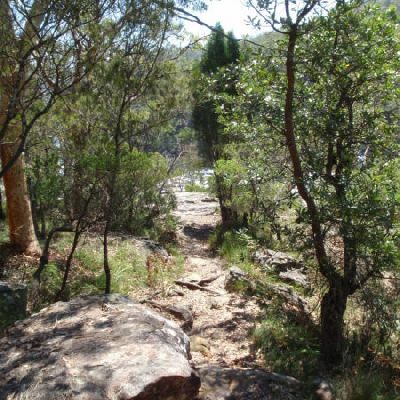 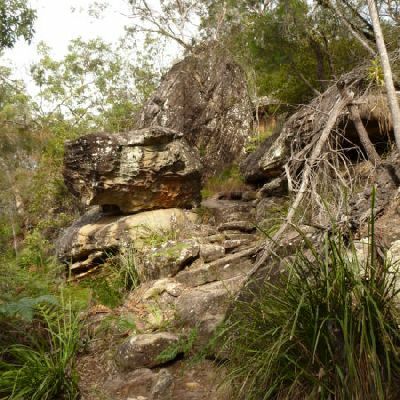 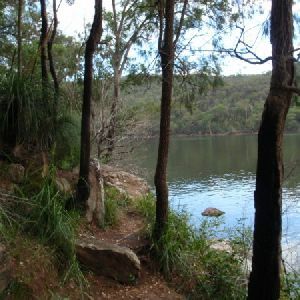 Starting in North Turramurra, this walk follows the Darri and Warrimoo Tracks through Ku-ring-gai Chase National Park and down along the picturesque Cowan Creek. 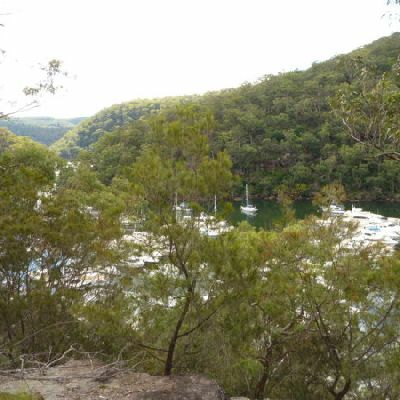 Bobbin Head makes a great spot to take a break and have some lunch at the cafe, kiosk or picnic area. 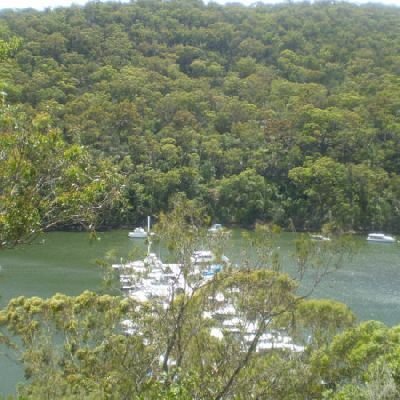 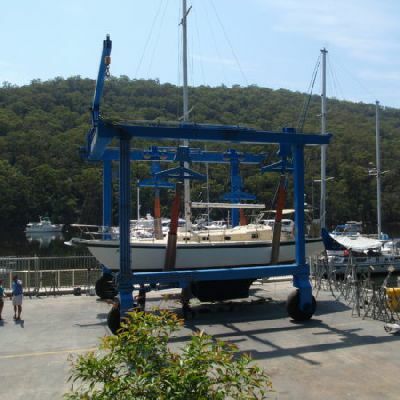 From Bobbin Head, the track continues through Apple Tree Bay, following Cowan Creek for a little while before climbing up and out of the valley to Mt Kuring-gai station.